St. Martin's Paperbacks, 9781250146441, 496pp. 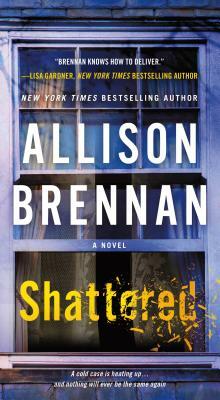 Allison Brennan’s New York Times bestselling Lucy Kincaid and Max Revere series collide in Shattered, a powerful tale of revenge, betrayal, and the desire for justice. Over a span of twenty years, four boys have been kidnapped from their bedrooms, suffocated, and buried in a shallow grave. Serial killer or coincidence? That’s the question investigative reporter Maxine Revere sets out to answer when an old friend begs her to help exonerate his wife, who has been charged with their son’s recent murder. Max turns her attention to three similar cold cases. If she can solve them, she might be able to help her friend. Haunted by her nephew Justin’s death for years, FBI Agent Lucy Kincaid yearns to give her family—and herself—the closure they need. When Max shares her theory on all three cases—that Justin may have been the first victim of a serial killer—Lucy is convinced that between Max’s research and her experience they can catch a killer and justice will finally be served. But the very private Lucy doesn’t trust the reporter any more than Max trusts a cop. Max and Lucy must find a way to work together to untangle lies, misinformation, and evidence to develop a profile of the killer. Together, they make a shocking discovery: Justin’s killer is still out there…stalking another victim…and they already may be too late.